to grow South Africa towards a brighter tomorrow. 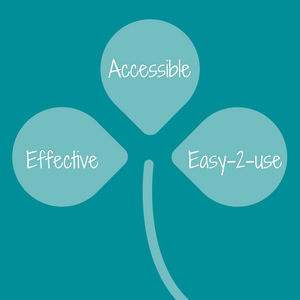 In a nutshell, EduTree aims to create a fresh, accessible approach to exam and test revision. The way we see it, EduTree is the answer to common revision problems faced by students across the country. We believe it's not just a matter of nourishing the tree, but doing it in the best possible way. 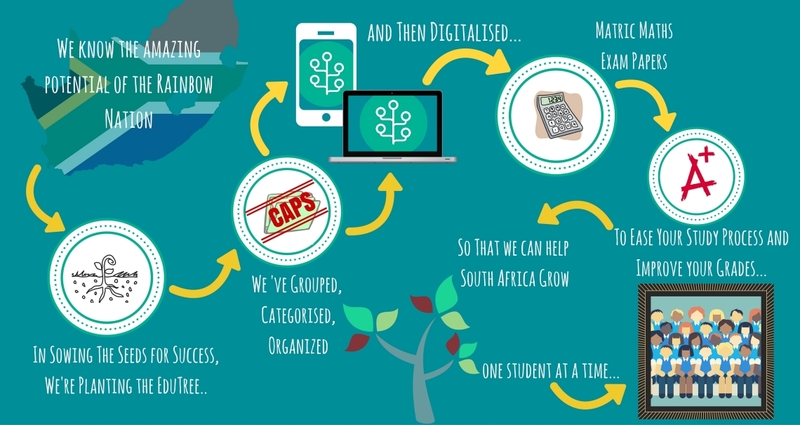 In doing so, EduTree hopes to help students grow by making Maths easier and more enjoyable. Sign in to your EduTree profile where you'll find your personal study cubicle – we call it the dashboard. Here you'll find your practice options and can monitor your progress. 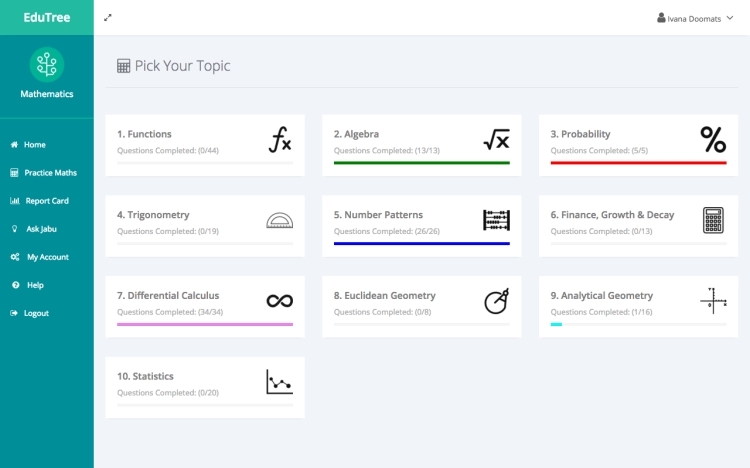 Select the section you want to practice, from one of the 10 CAPS aligned module: Functions, Algebra, Probability, Trigonometry, Number Patterns, Finance, Differential Calculus, Euclidean Geometry, Analytical Geometry and Statistics. View the entire question before answering it – we've broken each question down and given you five possible answers to choose from. If you're stuck, check out the memo or just move onto the next question. If you want to work through your answers with a memo, use Jabu to help you simplify, solve or graph a question – Jabu will provide you with step-by-step solutions to your question. Perhaps one of the biggest struggles in revision is finding the right and relevant stuff to revise. Intense efforts are put into looking through past papers, for questions that can be attempted and those that can maybe-kind-of-sort-of be tried. This uses up both the time and energy that can be put into the questions themselves! 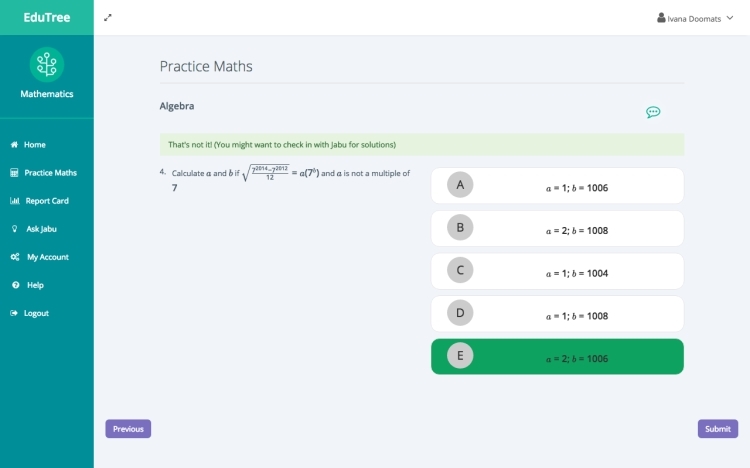 Practice your maths by answering a range of questions taken from official CAPS exams and organised into course categories. Answer questions at your own pace, repeat ones you've struggled with and skip those that you want to come back to later -then review your attempts against answer solutions. 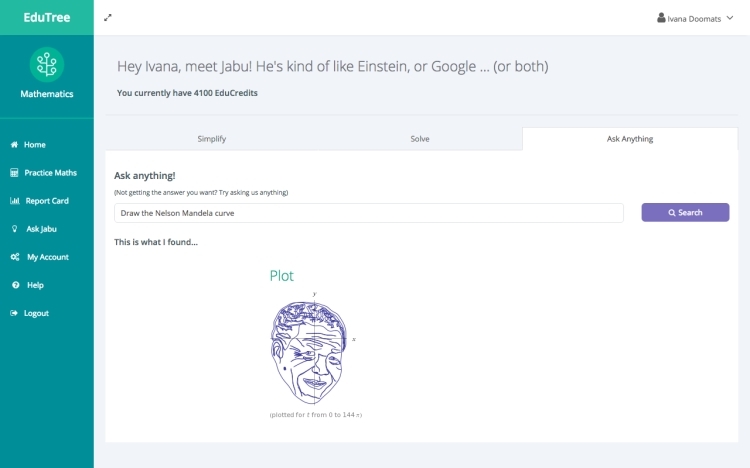 Credits are the currency we use in the world of EduTree – earn credits on each correctly answered question, then use these credits to access premium features on the application, like handy hints from Jabu and other hidden surprises you’ll want to get in on. The more you answer, the higher your EduCredit balance! Meet Jabu – your all-in-one study buddy and teaching assistant – ask him anything from study tips, to science questions to exam timetables: he’s got you covered. To make use of Jabu’s genius-power, earn EduCredits and then use these to simplify, solve, or research with Jabu. 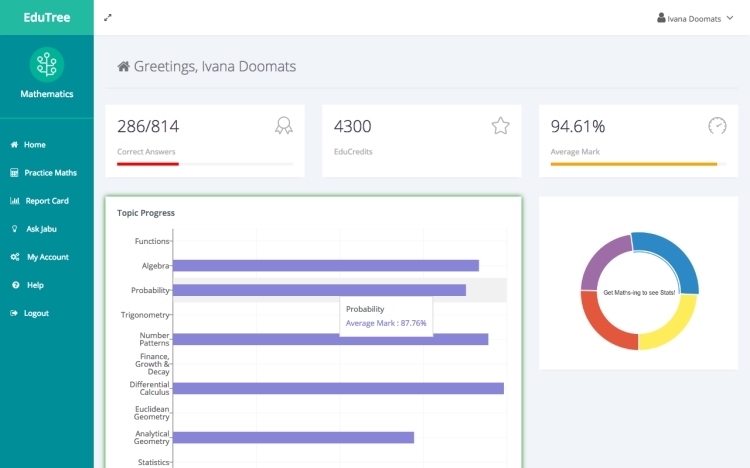 Monitor your progress on the dashboard – check out your rankings against other students so you can get an idea of where your peers are at in their preparations and decide where you'd like to be. Then keep track of these goals on your way to reaching them! EduTree is constantly looking to develop itself to best suit the needs of users, and the education community in South Africa. Sign-up and try out EduTree and if you like what you see recommend us to your students, teachers, classmates, peers and colleagues! If you have thoughts and suggestions about how we can make the learning experience better for you, drop us a message and let us know! We are always excited about engaging in new projects, interacting with like-minded groups and looking for innovative ways to turn collaboration into achievement. If you would like to help sponsor some seeds on their paths to becoming trees or if you would like to become an EduTree partner, get in touch with us and we’ll get back to you with more information about this kind of synergy.